A threat who lurks the night. To keep this thief at bay. Shall fall to Usul's hold. Until you miss your gold. Through windows shall she swing. And you won't hear a thing. Of Usul, dressed in green. For she's so rarely seen. So brilliant is her gaze. Lost to the shadowed haze. Friends, is in one simple concept: tail care. The condition of your tail says much about you. The quality overall. Now, aren't you jealous? Simple. Your tail requires care in its upkeep. It requires patience and a gentle touch. Done right, all that brushing is quite relaxing. Usul Tail Shampoo. It's all you'll need. There, aren't things appearing more simple? Excellent. Now, friends, go out there and gleam! fights again to break its cage. have long not seen use, and will nevermore. thrashing with hate and thoughts of dark mind. a factor once aiding in trouble's release. where nothing but keys make the solitude subset. to remind them of nightmares they wish not to see. and Darigans are cunning, never dropping the ball. much colder than many ever wish to know. being too cruel and evil for most to define. for being, undoubtedly, the most scorned. only magic-borne foods yet keeping it alive. devising its escape all night and all day. as the broken restraints begin to wane. and, along with it, the demons long past. In eyes seeing more than their share. Of this brunette damsel so fair. For there are none who can rival this maiden. As she dashes though pitfalls and traps. Without fear, cowardice -- or good maps. And bravery beats in her blood. Of perilous plunges in tunnels that flood. To those who dare question her skill. And defeat them by sheer force of will. But of theft she does keep her hands clean. There is many a yarn she will tell. Then she'll smile and bid you farewell. For she loves to play. The electric Usul she's just passed! Up she goes, landing with a thump. Now that position is in the past. Much to the ecstatic crowd's excited cries. "Go, go, go! You can do it, you can win! You have the power, deep within!" First position she hopes to earn. Within her comfort zone she's hard to pass. The rainbow Usul keeps her mind on the prize. There's not far to go; the two are neck and neck. One will win; the other will be a wreck. The crowd are screaming, they all let out a cheer! The snow Usul thinks of the medal she will don. The snow Usul realises that she has lost. The snow Usul takes second place on the stand. Thanks not to luck, but a strict training regime. Her once keen opponent admitting her fall. Maybe I would have won, and soared." Admiring the winner's trophy's gold plaque. But first I must learn that there's no guarantee." 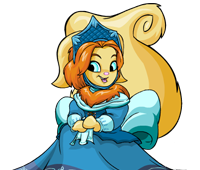 And the festive Neopian cheers. Through the luxurious rooms they prance. As long as the celebration will last. At the joyous Usul Masquerade. Vaults were filled and emptied. On this cold and gusty evening. By then the vaults were empty. Her bags empty and waiting. And entered the National Neopian Bank. They were simple to her. With her lock-picking tools in hand. As she worked from vault to vault. In that cold and gusty night. So skilfully does she disappear. The managers think that nothing had entered. And then they entered the vault. Sensing danger in the air. Thieves and rogues and knaves. Should give up their patrol. Is outside of their control! Up a ladder made of rope. Has won the endless chase. For merely a shadow, I be. A figure of blackness, passing by. But I'm not seen, for I'm quite sly. They spot you from a mile away. That your possessions have gone astray. And of me, many do fear. "The Shadow Usul might appear!" By day, I long for the night. For why am I disliked by all? Even if it's for reasons small.